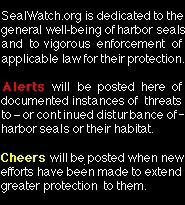 SEALWATCH.ORG - Cheers for Long Island! Stay on the upper part of the beach or bluffs and away from the water's edge. Remain quiet and calm during the observation. Never throw objects at the animal or in the water. If you encounter a seal on the beach stay at least 100 yards away. Long Island Seal Walk tours November - May.